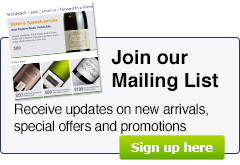 Browse our selection of great value, award winning, red wine, white wine, champagne, sparkling wine; beer, cider & spirits and create your own mixed case - Free delivery* to all areas of Hong Kong. Our chardonnay reveals a fragrant nose, full of stone fruit and floral aromas. Barrel fermentation brings another layer of complexity with hints of vanilla and toasty nutty characters. A textured mouth feel unfolds with layers of citrus, stone fruit and florals. Vanilla and toasty notes combine with a beautifully balanced acidity to finish long and fresh. Delicate, notes of citrus blossom, honeysuckle and peach fuzz mingle with undertones of crème caramel and vanilla. The palate exhibits refined fruit flavours of honey dew, citrus and fig with a sprinkle of nutmeal and an enduring, fine, mineral acidity to finish. Complex and elegant, it delivers lovely citrus, nectarine and apricot aromas balanced by subtle oakiness. A rich and silky palate. Single Vineyard Anna's from the Awatere Valley is a lively, elegant, serious Chardonnay. The palate is elegant in proportion, but very concentrated with fresh, bright citrus fruits that have a luscious note, some tropical fruit hints, nutty oak and racy, minerally acidity. Very fine textures carry the line to a long nutty, toast infused citrus fruit finish. Patriarche Meursault, light gold. On the nose, oak ageing gives notes of dried fruits and vanilla with ripe lemon. The palate is well-structured and supported by remarkable freshness. Focused, full and persistent across the palate. Patriarche Puligny-Montrachet. Intense and luminous golden yellow. On the nose, evolving on woody and flowery notes, dried fruits like almonds or hazel nuts. Palate : balanced attack, rich and fleshy with a beautiful typicity, pleasant length. Food pairing : poultry in creamed sauce, grilled or cooked fish. The bouquet sparkles with delicate fresh violets in a setting of white peaches. The soft delicate flavours continue while the senses are tickled by the most delicate of fine bubbles. Though this is such a fine delicate wine, the complexity is astounding, along with its length.